Week 4 : Post mortem | EFF Football! 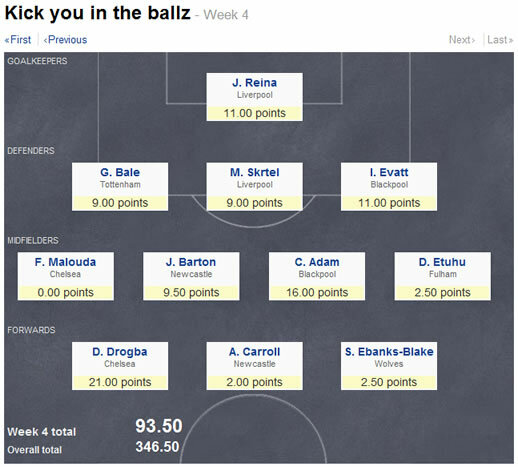 Mess up with Yahoo scores last week! What a great Monday morning this is! The sun is shining in Cape Town, bringing with it…the promise of summer 🙂 How could we NOT be happy today. OH, thats right.. if we didnt do well in the Fantasy this past weekend. Well, luckily for most, it was a pretty good weekend. The Man U 3-3 draw with Berbatov scoring again. Surprise Surprise! Whats happening with this guy? Spurs draw?! I thought they’d win that game for sure. So that was a surprise! Fulham vs Wolves…. I dont even want to talk about it. I committed the classic mistake of having Dembele in my team – and then selling him and rather going with Ebanks-Blake?! My guy scoring 2.5 and Dembele scoring 27.5. Are you KIDDING ME!?? I’m also behind 3rd place by a mere 3 points. BIG decision coming up this week. Shall I keep Reina when he’s playing against my team next week??? Any advice? Man and Pool both arent looking to good…. I wouldnt mind maybe getting in on the Berb action again – but then Id have to change keepers.